A good showing by Borders athletes at the championships. Sportif, which has judo clubs locally in the Borders, topped the medal table at the National Judo Championships, held recently in the Emirates Arena in Glasgow. The club’s enthusiasts took home a total of 19 gold medals, nine silver and 16 bronze. Sportif Judo club was established in the Borders in 2002 and has clubs in Kelso, Lauder, Peebles and Melrose. judo and, very importantly, give all our members a pathway to reach their individual potential. “We created Sportif Judo Excel Talent Programme in 2004, specifically to give committed and talented players the opportunity be all they can be. 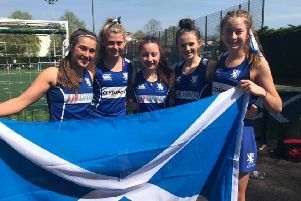 “The Excel Programme has produced countless Scottish Team and many Team GB members including, from the Borders, Abbi Blackie and Imogen Walls, both of whom represented Team GB at the Youth Olympics. “We have had outstanding support from Live Borders Active Schools, which has been with us every step of the way, and we know our development and success is linked to that partnership,” added Peter. The Borders Athlete Support Programme has also played an integral part in the success of the team, especially with Abbi and Imogen, who benefited greatly from the strength and conditioning and other support services provided by the ASP Programme. In recent months, the players and young athletes from the Sportif Excel Programme have been hard at work in the build- up to the Scottish National Championships. Going into the Championships, Sportif Judo’s track record was nothing short of amazing, as it had topped the medal table at the event for the previous 11 years straightin succession. tournaments and sometimes I do feel a little bit nervous going into a match. But that passes when I get started. After two intensive days of contest, the results were in – 19 golds secured Sportif’s place at the top of the medal table for the 12th year in a row, again raising the bar, ball securely in hand. Gold – Saul McRitchie (Earlston High School), Emily Fortune (Lauder Primary School), Katy Cameron (St Boswells Primary School), Toru Keen (Priorsford Primary School), Pheobe Franklin White (Priorsford Primary School), Maia Thomson (Melrose Primary School). Silver – Luke Thomson (Earlston High School), Imogen McRitchie (Lauder Primary School). Bronze – Dylan Greens and Blair Millar (both Peebles High School), Alex Dickson (Kelso High School). Sportif Judo has classes throughout the Borders – for more information, visit www.sportifjudo.com or phone 01896 800 334, email info@sportifjudo.com or text or call 0773 460 2336.